PRETORIA, SOUTH AFRICA -- New York Army National Guard Specialist Robert Blake, an Alden resident, is one of 38 New York National Guard members representing the United States military at Africa's largest air show, held every other year outside Pretoria South Africa. Blake is one of several members of Company D of the 152nd Brigade Engineer Battalion who are part of a team that will be displaying an RQ-7 "Shadow" unmanned aerial vehicle at the African Aerospace and Defence Exhibition 2018 which is being held at Waterkloof Air Force Base. The event began on Sept. 19. The RQ-7 is a radio-controlled, 185 pound airplane with a 20 foot wingspan used used by United States Army brigades to provide aerial surveillance and reconnaissance. The aircraft is launched and controlled by a dedicated platoon that supports the brigade intelligence section. 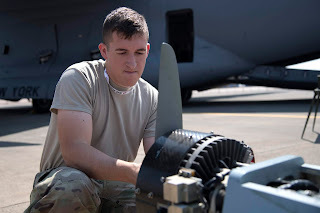 Blake and the other Soldiers who provide RQ-7 support to the New York Army National Guard's 27th Infantry Brigade Combat Team are based at the Army Aviation Support Facility at the Greater Rochester International Airport. The New York National Guard also a C-17 Globemaster III strategic airlifter from the 105th Airlift Wing, based at Stewart Air National Guard Base in Newburgh, and an LC-130 tactical airlift plane from the 109th Airlift Wing, located at Stratton Air National Guard Base in Scotia, to the airshow. The C-17 is used to fly supplies and troops and is one of the world's premier transportation aircraft. The LC-130 is the largest aircraft in the world which can land on runways or on ice and snow using skis or wheels. The 109th Airlift Wing LC-130s are used to fly supplies to scientific installations in Antarctica and Greenland. The New York National Guard has a training and military exchange partnership with the South African National Defense Force through the National Guard's State Partnership Program. The program links a unique component of the Department of Defense - a state's National Guard - with the armed forces or equivalent of a partner country in a cooperative, mutually beneficial relationship. The New York National Guard has been participating in the African Aerospace and Defence show since 2004.